We had some friends over for a very small, casual BBQ. It was a last minute get together, and I didn’t want to spend a ton of time in the kitchen since it’s been so very hot out lately. I made a few quick side dishes, my husband was in charge of smoking a brisket on the grill outside, and all that was left to think about was dessert. Given the soaring high temperatures, I decided to get some ice cream from our favorite spot (Hornstra Farm if you’re local! 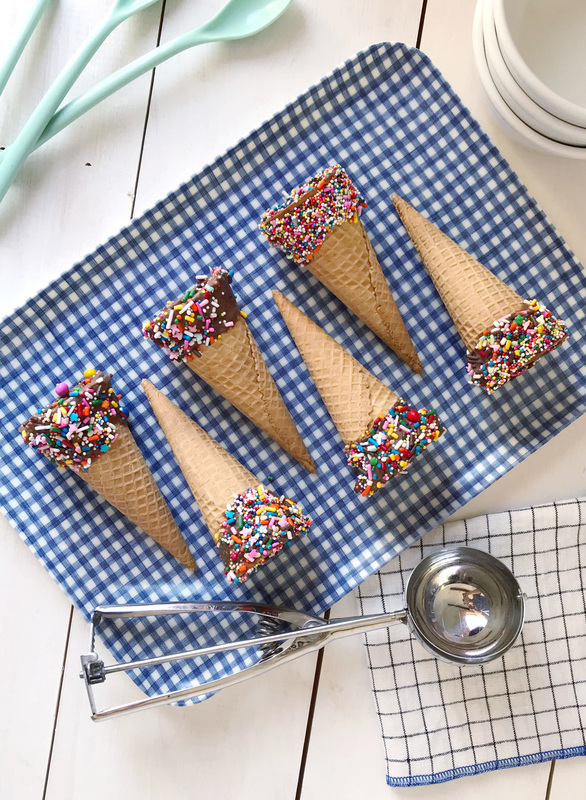 ), and ice cream cones for serving. Jane is very into ice cream cones right now — she is fascinated by being able to both hold the cone and eat it. I get her fascination — what a wonderful, practical, and delicious invention! 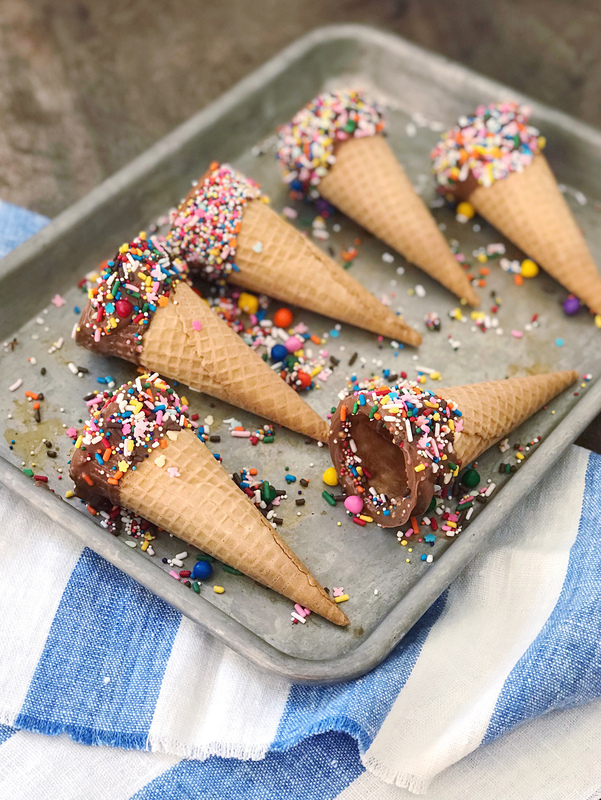 I decided since it was a special occasion that I would jazz the cones up a bit and dunk them in chocolate and sprinkles. To make them, I filled a small pot with about two inches of water and brought it to a simmer. Then I placed a heat proof bowl on top of the pot and filled it with chopped up milk chocolate bars. Use a whisk to stir the chocolate as it melts, until it becomes completely smooth. Remove the bowl from the pot and begin to dip the cones in the chocolate — I did about a 1″ band of chocolate. 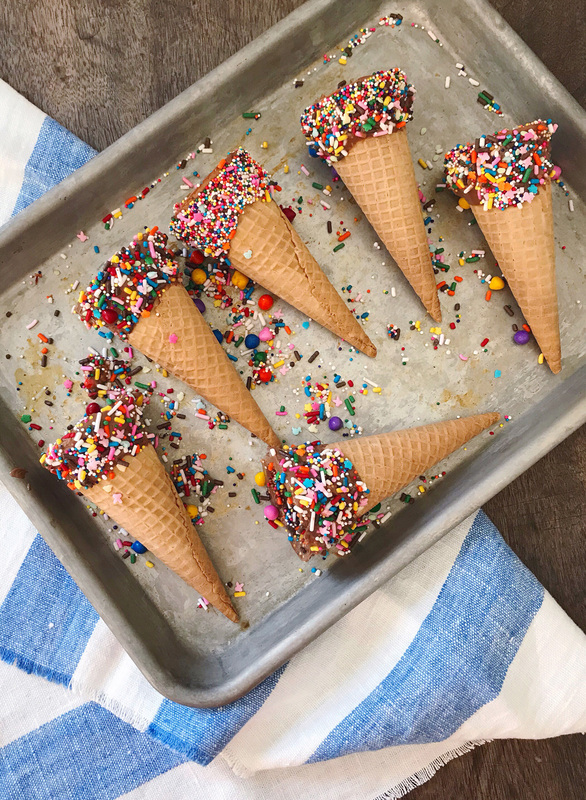 Let them cool on a parchment lined tray for 30-60 seconds and then top them with rainbow sprinkles. 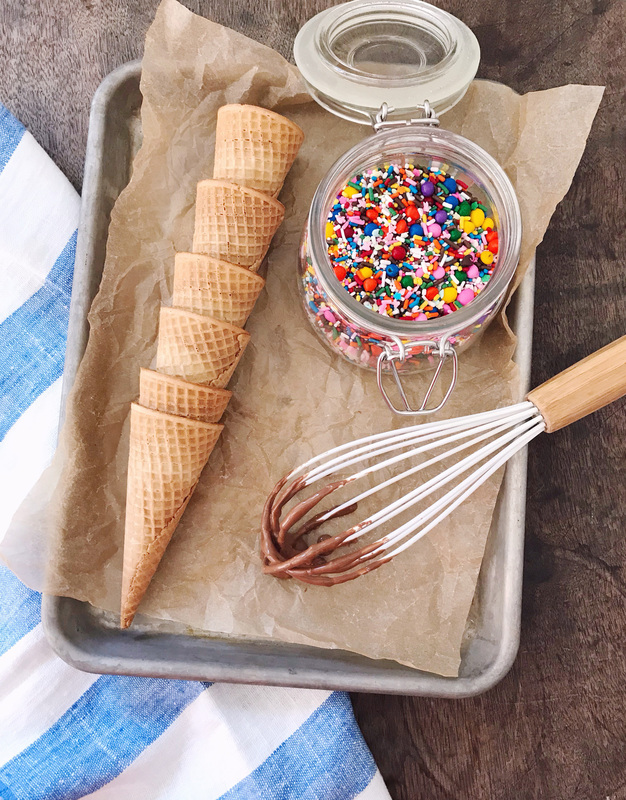 The sprinkles should stick to the chocolate as it cools and begins to set. I kept them in the refrigerator for about 1 hour before serving to make sure the chocolate fully cooled, and then filled them up with everyone’s favorite ice cream flavors after dinner! It was such a tasty treat! Sesame Ginger Chicken and Broccoli Slaw. Budgets, Savings, and Kids. One Response to "Chocolate Dipped Sprinkle Cones." The perfect summer treat! I love ice cream but don’t have cones nearly enough! They are so yummy!